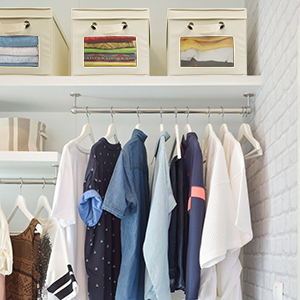 Featuring a transparent panel in the front, the Clothes Organizer makes it a breeze to identify contents without unzipping or having to pull off of a shelf to see. 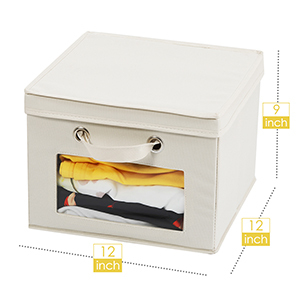 The Collapsible Organizer is made of durable polyester, nonwoven fabric, PVC window and cardboards. Each could hold up to 26 lbs. 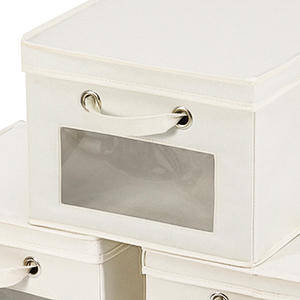 Removable lids make these boxes stackable and keep your stuff cleaner and better contained. 1. Avoid using in damp environments. These Lidded Closet Containers with simple design are excellent storage solutions and stylish additions to any home or office. They can be used to store toys or books in your kid’s room, or to store clothes in bedroom or inside a closet. 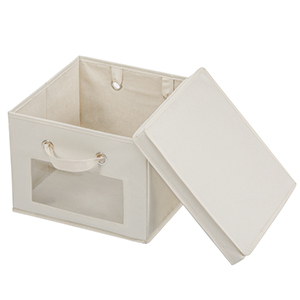 Featuring sewn-in handles on the front and back, these Storage Boxes function like drawers when placed on shelf, sliding in and pulling out for quick access to your stored items. 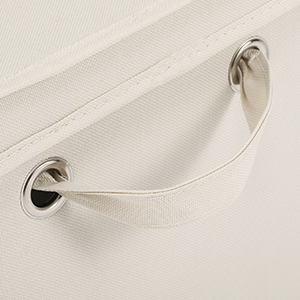 Sturdy handles also allow easy carrying from one location to another.